Appleton Gospel Church is located in downtown Appleton, WI. Join us for worship at the downtown Appleton YMCA on Sundays at 10am. We would love for you to visit! Our mission is sharing good news and our vision is that the good news of Jesus Christ will transform the people of the city in every way. Our dream is to see good news transform as many people as possible in Wisconsin and beyond. Appleton Gospel Church began in 2010 as a small group of 35 people led by David and Holly Parks. Meeting in the upper rooms of the former Harmony Cafe, they dreamed of a church that would love and serve the city of Appleton in Jesus’ name; a church where people could follow Jesus and help others do the same; a church where faith would have everything to do with the regular stuff of life. On Easter Sunday, April 24, 2011, Appleton Gospel launched in public worship. Almost exactly two years later, on April 12, 2013, Appleton Gospel was welcomed into the EFCA as a full member church. Today, we seek to continue to plant healthy churches through our church planter residency program and our partnership with the EFCA. No matter who you are, what you’ve done, or what you believe, we would love it if you would join us as we learn to follow Jesus together in life. Our dream is to see lives transformed by good news ripple out from Appleton—even to the ends of the earth! We believe that it takes all kinds of churches to reach all kinds of people. So by planting healthy, gospel-centered churches—by being a sending church—we will effectively share the good news of Jesus in word and deed with a world that is lost without him. Currently—Appleton Gospel is the sending church supporting the church plant Village Community Church in Kimberly, WI. For more info and/or to give to support this work, go to villagecommunitychurch.net. Rev. 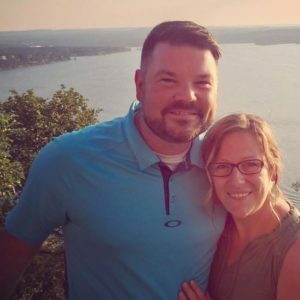 David Parks is the founding pastor of Appleton Gospel Church, founder of Good News For Leaders, husband of Holly, and dad of three kids. Ordained in the EFCA. Located in Appleton, WI. Personal mission: to help people find stability and hope in this crazy world by sharing good news every week.